The seven stories that make up this collection were originally published in China between 1987 and 1991, early in the author’s career. 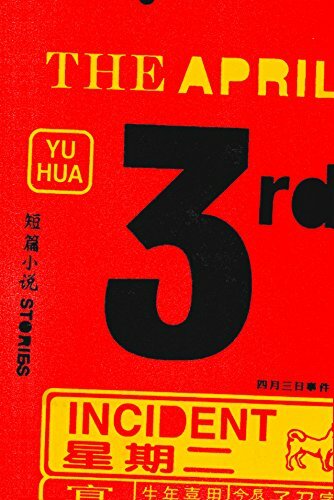 Relying more on language, setting, and tone than on traditional narrative, these stories reflect, as the translator notes, Hua’s “interest in testing the boundaries of contemporary Chinese fiction.” Though bewildering at times, the result is a surprisingly satisfying experience precisely because it challenges preconceived expectations of the form. Each story is its own, yet they all share the same sense of oddness and ambiguity. Nothing is fixed or determined: narrators shift, events change, recollections blur. Each story feels deeply subjective—nothing is to be trusted—and the result is simultaneously unsettling and intriguing. Just when something seems clear, it’s upended. The people within the stories don’t even understand their specifics. In the title story, the main character is stricken with an unfounded paranoia. “He found it hard to make a determination. It seemed that he was the man, and also that he wasn’t.” Haunted by his own confounded conspiracy theory, the main character finds patterns that may or may not exist, questions actions that may or may not be suspicious, and ultimately leads himself (and the reader) on a labyrinthine goose chase of clouded identities. Oddly, the chase doesn’t grow old. Rather, it becomes more and more intriguing. The atmosphere of the title story is built largely through repetition—a technique that Hua employs throughout the entire collection—though the repetition is never exact. In the midst of his suspicions, the main character observes “furtiveness in several of the fragmented reflections” he’s watching in a display window. This line manages to capture much of the book’s overall feeling: the characters’ actions are furtive, and they live in worlds of fragmented reflections. “In Memory of Miss Willow Yang” uses repetition even more, replaying moments, conversations, and actions until everything becomes an echo of itself. Characters mimic each other, stories get retold, moments from the past return. Still, Hua grounds these disorienting reverberations in precise detail. The world may be spinning, but there is a man with skin like “a tree trunk just stripped of its bark” and “veins spread as luxuriantly as green grass.” There are buried bombs and swift rivers, bus terminals and bamboo groves. The spinning world brings these images into even starker focus, and they become imbued with significance that may not be deserved. If these elements weren’t enough of a departure from traditional narrative, Hua also has a special knack for making the mundane surreal. At one point, a character simply starts walking, but Hua’s description makes it something else entirely. “So he let his legs start moving. The movement felt comical, all the more so when his arms started moving back and forth as though they were walking too.” By making the arms “walk” with the legs, the action somehow transforms itself into a challenging (and comedic) feat. Comical moments arise again and again throughout these stories, and the humor is often based in absurdity. The narrator of “As the North Wind Howled” wakes to a loud knocking on his door. Before he can respond, the door crashes to the ground. This is but the first of a series of oddities that plague the narrator who is caught in a humorous and tragic case of mistaken identity (or is he?). There is also an absurdity in the lack of agency so many characters experience. In “Death Chronicle,” the narrator relays his own heinous actions through a flattened blameless voice. He does not turn his truck onto the road that leads to the first terrible incident, but rather he reports, “my truck turned right.” A few sentences later, he reports hitting a boy with his vehicle and knocking him into the reservoir below. “I really couldn’t help it.” The rest of the story is studded with the same vague passivity, which is as maddening as it is calming. Ultimately, this is a collection about the many layers of perception. At its base, perception pursues clarity. To perceive is to seek understanding. Yet, Hua’s stories throw that into question. Who is to tell what is real or fabricated? What is true or false? What is new or old, mine or yours, simple or complex? Who is to say what is perception and what is misperception? Like some of the best literature, these stories ask more questions than they answer. Virginia Reeves is author of the novel Work Like Any Other (Scribner), longlisted for the Man Booker Prize and the Center for Fiction's First Novel Prize.